CHARLOTTE, N.C. -- On every kickoff return, Anthony Ratliff-Williams sizes up many moving parts. All at once he must follow the ball, catch it and scan the field for tacklers, looking for running room. That skill takes a special knack, and the North Carolina redshirt junior has it -- and more. His powers of observation helped him find playing time sooner than expected. Ratliff-Williams willingly switched from dual-threat quarterback in-waiting to a path that has him ranked among the top college wide receivers and kicker returners in the nation. Quarterbacks don’t give up the position easily, so that makes the 6-foot-1, 205-pounder, too. Ratliff-Williams’ switch happened a little bit at a time and then all at once. 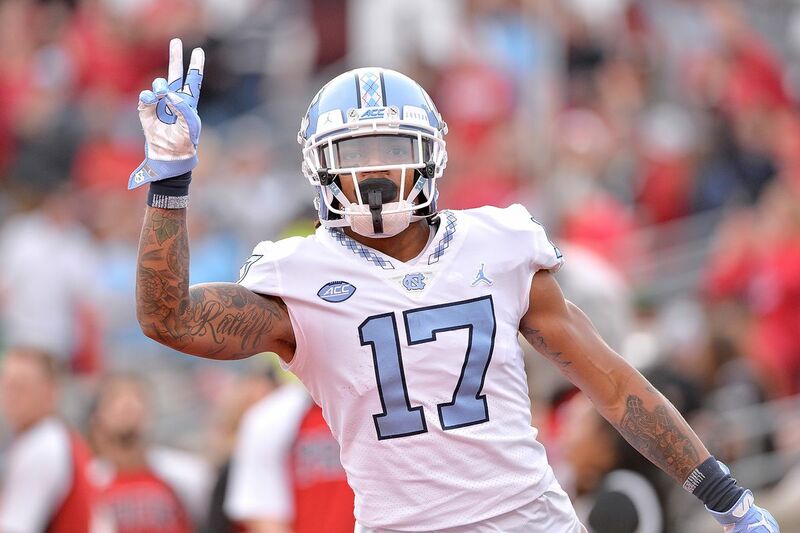 He arrived on campus in 2015 intending to redshirt while learning in the quarterback room behind returning starter Marquise Williams and his heir apparent, Mitch Trubisky. But as the Tar Heels prepared for their 2015 season opener against South Carolina, it was apparent to players and coaches alike the scout team wide receivers weren’t properly preparing the Tar Heels’ starting defensive backs. The lightbulb flicked on in North Carolina head coach Larry Fedora’s head. Ratlff-Williams has run his way to All-ACC honors as a first-team specialist as a kick returner and third-team all-purpose pick when combining his receiving. He caught 35 passes for 630 yards and six touchdowns. On kick returns, he averaged 26.3 yards with two taken back for touchdowns. His long reception went for 51 yards and his long kick return was 98. Now he wants to add to those numbers with a full year under his belt after a redshirt in 2015 and limited playing time in 2016. He’s even out-run the quarterbacks on North Carolina’s roster. Quarterbacks are typically the star players that coaches bring to a conference’s media days, but Fedora chose the ACC Kickoff as a Ratliff-Williams homecoming; he’s from Matthews Butler in suburban Charlotte. It’s worked out so well, Ratliff-Williams isn’t second-guessing himself that he might now otherwise be in the quarterback battle. At the time he switched, Fedora expected Trubisky as his starter in 2016 and 2017. But after a strong 2016 season, Trubisky played himself to the top of the NFL draft’s first round. The Chicago Bears took him with the second pick of the 2017 draft. With Ratliff-Williams trying to make the quarterback’s job easier with his receptions, junior Nathan Elliott and sophomore Chazz Surratt switched off and on. They remain locked into battle for the starting job entering fall camp. Surratt played in nine games, completing 107-183 passes (58.5) for 1,342 yards with eight touchdowns and three interceptions. Elliott played in five games, connecting on 75-of-145 passes (51.4) for 10 touchdowns and five interceptions. But Ratliff-Williams is focused on building on last year’s improvement. Without saying it, he also knows his kick return ability – which he couldn’t showcase if he was a quarterback – adds to his NFL value when the time arrives.There aren't many 6-1 quarterbacks in the NFL. They are even fewer sophomores in college with two kickoff returns for college. On the quarterback battle, Ratliff-Williams said he has confidence in either player that emerges as the starter for the opener on Sept. 1 at Cal. He says he’s more concerned about the team learning to overcome adversity, something it struggled with last year with a 3-9 record.